Another friday woohoo! Unfortunately just class 9-5, nothing special. Ugh... sitting in class for 8 hours. We really should be getting paid for that, it's pretty much a whole frigging work day!!! Another Friday, another song to share. Actually I'll make it two cause I really love them both and why not? 1 album, 1 blood, 2 musicians, so 2 songs. I know, but take it like that sha. 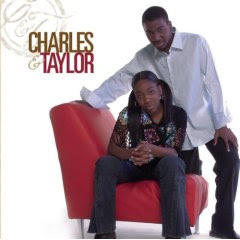 It's Charles and Taylor!!! hehehe I doubt if a lot of people have heard about them before but they're amazing. Just hear for yourself. I wish I could do a proper write up on them, just no time. Here's what you need to know about them: they're siblings, at the time they recorded and released (2005) this album he was 15 years old and she was 13 years old. Yeah you heard me right. Now you know their ages, please listen to them sing and tell me they're not all that and a bag of rice. I've always said it - God did not share talents equally when he was distributing them lol! Taylor was only 13 but just hear the big voice she has. Sheesh... where was I and what was I doing when I was 13??? They really are blessed. Anywhoo they need to hurry up with another CD already! Alright first song up - You are God Alone (Not a god). Some of you might have heard this song before; the Phillips, Craig, and Dean version or like my brother will say, "the white version" hehehe. Please o it really had nothing to do with race, it was just his way of differentiating. I remember the first time he heard Charles & Taylor's version. He was like "is that like the black version remix of the song or what?" LOL, I couldn't help but burst out laughing cause he was actually serious when he asked. Enjoy y'all and again, have a great and safe weekend! C&T are real good. They don't even sound like teens. sisi I'm glad you felt the same way I felt when I first heard them! The only thing I could say was "Izzzz a lieeee!!!" lol. No, they're African Americans and don't worry, I've placed a link on their names to their website. Check them out! They're one of the country's best secret hehehe. By the way, they look more grown on their website now. 8 hours in class? Whatever for...that is so not healthy!. Loved the tracks. How you dey? @ parakeet - my deeaarr, na God still they patch me together o so I dey! 8 hrs for class cause that's how my program is set up; online classes with 3 saturday meeting days. And each class is like for 6 wks. god dey sha. Hope u're well?